Here is an interesting percussion pistol made by Boutet. The ramrod is a replacement and there is a metal piece on the left side behind the action that fills a hollow in the grip, but this piece also seems to be a replacement. I would be interested to know about what year (or period of years) was this pistol made. Also, were these individually made or produced in series? 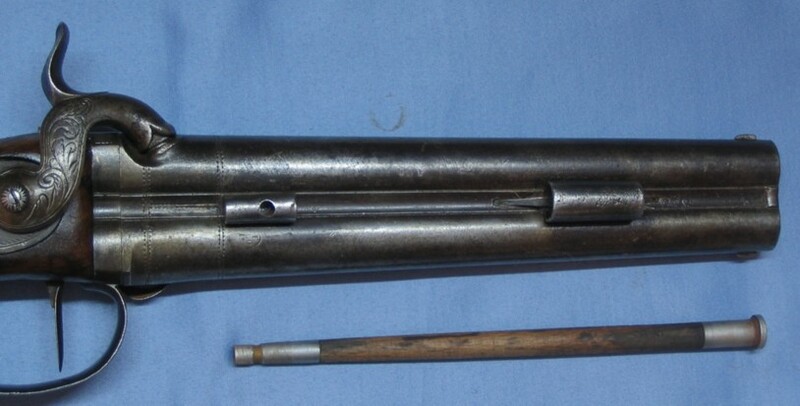 Boutet Versailles 2-Barrel Percussion Pistol, cal 60, no serial #, barrels 7 1/2 inches, overall 13 inches, and rotating barrels. What is confusing to me is that the Boutet Versailles mark would make this French, but on the barrel it seems to have a clear Liege mark. I am not a specialist in BOUTET Nicolas Director-artist of the Imperial Manufacture of weapons of Versailles under NAPOLEON. It had fasteners in Liege since it is known that it had taken again in writing pad the Imperial Manufacture of weapons of Liege about 1808. WATERLOO put an end to the imperial reign and the presence of BOUTET in Liege. I believe it that it worked under LOUIS XVIII until 1818. This is why the gun that you present challenges me since it is with percussion and lock postpones i.e. quite after 1818! I am unaware of if the son of BOUTET continued to produce weapons in Versailles after his father that would be an explanation. This pistol makes me think (with reserves) of the pistol model 1855 of officer of French STATE MAJOR adopted by Napoleon III. This type of weapon was manufactured by several great names of French arms manufacture like DEVISME - GASTINE-RENETTE - FAURé LEPAGE - CARRON and PRELAT. On certain alternatives of Liège of late manufacture and poor quality, one often notes the absence of side rod, unrifled bores and a mono trigger with double function. The lock with percussion known as reversed is of type 1840. I deliver to you this information with all the reserves of use, because the photographs do not enable me to have an idea in three dimensions of this weapon. Perhaps our French friends will be able to say some more. "a beautiful" fake. 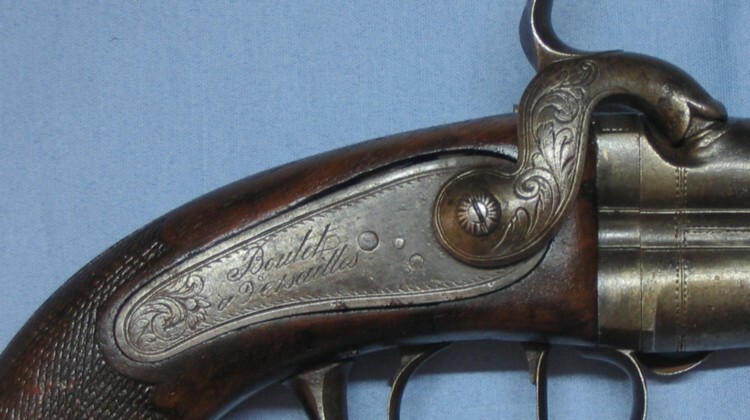 It is neither the style, neither the leg, nor the time of the Large Boutet of the "Manufacture d’armes de Versailles". 5) The style evokes the British pistols of voyage from time or the model 1855 lawful French. As many reasons which make this weapon a gun well too late and ordinary to be a Boutet of origin. Hello Alain, I saw the answer of Jean-Pierre Bastié concerning the "Pistol Boutet with 2 barrels" I think that it rightly but I must however announce that in the gazette of the weapons No 23 of January 1975 an article of Jean Boudriot devoted to the end of the Manufacture of Versailles in 1818 when it states with the reference (5) on page 26 to have the memory of pistols with percussion signed by Boutet. 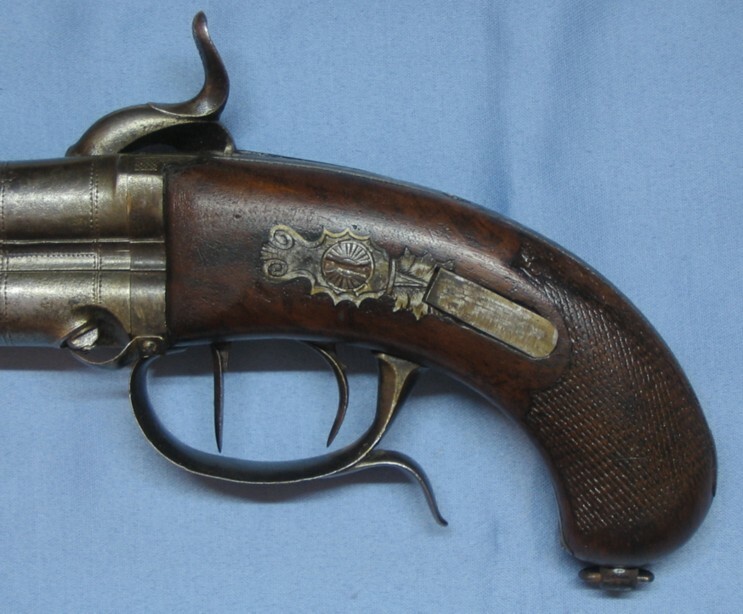 Moreover the first type of pistol of French lawful officer assembled with a reversed lock is the model 1833 (year of died of Nicolas Boutet) his son Pierre - Nicolas being already deceased in 1816 it thus does not have there more known Boutet descent. To which year does go back punch ELG struck this gun? I think that the response of J-P Bastié is the maid, but it would be interesting to have other opinions on this question. The mark of the proof tests of Liege (spangled ELG with five branches in an oval not crowned) was used of 1846 to 1893, which thus confirms impossibility that it acts of a true BOUTET.